NJFIT is a response to two basic concerns of New Jersey residents - public health and congestion. Traffic congestion and sprawling development patterns have threatened safety, ease of travel and the physical health of New Jersey residents. NJFIT is the New Jersey Department of Transportation's (NJDOT) solution to improve the quality of life for all that live and work in New Jersey. Increased risk of major diseases, such as diabetes, cardiovascular disease and colon cancer. Increased symptoms of depression and anxiety. Poorer development and maintenance of bones and muscles. considerably in the 10 years between 1996 and 2006. Increases social connection and a sense of community. 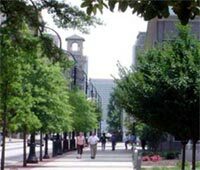 Healthy Community Design promotes physical activity through walking. Research by the University of British Columbia suggests that for every additional 30 minutes spent in the car, there is a three percent greater chance of being obese.